This IBM Redbooks publication is intended for use by those generally familiar with most of the iSeries IBM-provided performance tools available through the i5/OS operating system’s commands and the additional cost Performance Tools for iSeries, 5722-PT1, licensed program. i5/OS comes with a detailed program level performance data collection capability called the Performance Explorer (PEX). i5/OS commands supporting the collection include Add PEX Definition, Start Performance Explorer, and End Performance Explorer. One of the Performance Explorer (PEX) collection options is called Statistics (*STATS), which collects the program level performance statistics, including CPU usage, disk I/O activity, and the occurrence of certain i5/OS and System i microcode level events. The Print PEX Report function of 5722-PT1 provides a basic view of this *STATS data. 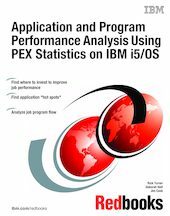 PEX Statistics provides a richer interface for collection and analysis of the *STATS performance data than is available through the i5/OS PEX command and the Print PEX Report output.